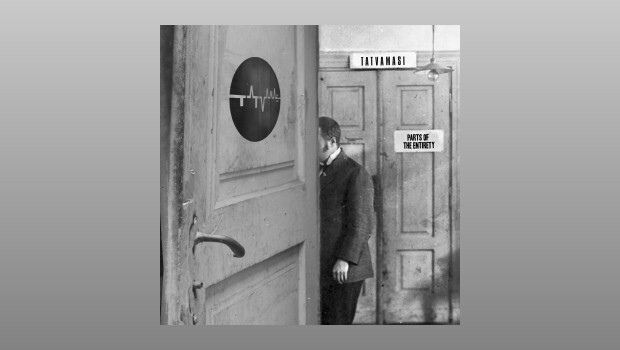 Tatvamasi are, for me at least, a hitherto unknown Polish band that fuse elements of Eastern European folk music with helpings of jazz, 60s underground rock music, and angular experimentalism. The band name derives from Sanskrit and loosely translated means “that thou art”, which bears some similarity to a quote from a famous run-off groove “do what thou wilt”. That gives you some idea of the freedom of expression that flows through the culvert of creativity that is Parts Of The Entirety. Tatvamasi have their origins in tragedy. In 2003, at the top of his game as a folk musician steeped in Polish and Ukranian roots music, guitarist Grzegorz Lesiak suffered a near terminal car crash that claimed the life of his travelling musical companion and cost him some of his hearing. Lesiak was hospitalised for many months and spent a decade away from the music scene, only to re-appear with the vision for Tavamasi fully formed. Taking an intense approach that drills down into the deepest depths of a song structure, the band’s music deconstructs and reconstructs in a manner not dissimilar to Fripp, but from a more jazz-based perspective. The above does not mean that Parts Of The Entirety is a dry intellectual exercise, far from it; the emotion expressed on the intensely structured but at the same time joyous Astoepos is tangible. The louder you play it, the more it will make the hairs on the back of your neck stand to attention. This album goes “skronk” and “kerrchang” in a manner that suggests a playful wrestle between Mel Collins-era Crim, and Ice Cream For Crow-era Beefheart, and a jolly fine racket it is too. Opening with Unsettled Cyclists Peloton we are immediately plunged into a familiar yet strangely new world of fast spiky rhythms and punchy melodies and fittingly cyclical counter melodies. This song easily conjures up the relentless nature of the symbiotic many-as-one beast that is a cyclists’ peloton as it charges its unstoppable way through the hinterland. Even when the beast takes its foot off the gas, the insistent rhythm is always there, this thing never stops. Bass guitarist Lukasz Downar really shines on the labyrinthine Rhubanabarb, his fingers flying up and down the frets in a fast repetitive cycle that sounds absolutely tiring to play. I can’t begin to compete with the description given this track in this knowingly pretentious phrase from the press release; “ (it) gyres and gimbles in the wabe, with all the mimsy ferocity of a Jabberwocky”. Yes, sirree! An Eccentric Introvert In A Study Filled With Broken Mirrors, a contender for track title of last year, and one reflected in the unsettling booklet artwork, commences in a funky mood before breaking down into almost free jazz territory, before a groove re-establishes itself. The guitar sound, largely unadorned with effects, on this track and indeed on the whole album, puts me in mind of the much missed Ollie Halsall on the early Patto records. Vying for supremacy throughout with the fine plank spanking is the tenor sax of Tomasz Piqtek, which gets to shoot off on a flight of improvisational fancy on An Eccentric… to great effect, the deft drumming of Krzysztof Redas forming the other half of the musical conversation with contrapuntal dexterity. Towards the end the loose-limbed funky groove is reprised as the song draws to a close, a song that tells you pretty much all you need to know about this fine bunch of musicians. Ending with a life-affirming barroom jazz-blues belter, Buy 2, Take 3 is a fittingly joyous romp full of spacious shuffles and fine interplay between the sax and guitar, and I can only conclude by saying that this is a damn fine debut album from a band I look forward to hearing much more of.